NHTSA—National Highway Traffic Safety Administration, for those who don’t know—and the other various alphabet-soup government agencies who keep track of roadway statistics tend to attribute the major causal factors of collisions on physical mechanics that are measurable. I understand this and accept it, because we have to start somewhere. 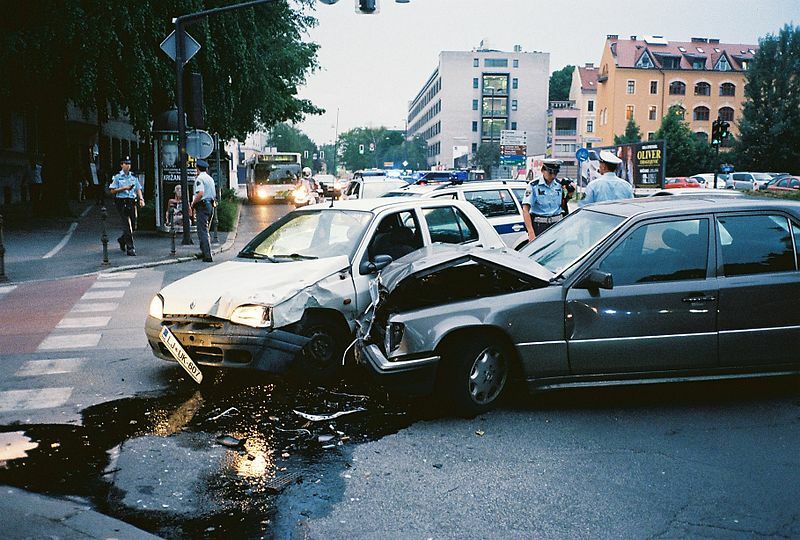 While it’s true that excessive speed is a major causal factor in collisions, it’s even more true that speed (specifically the change in speed: acceleration) is the single-most influencing factor in determining the severity of injuries sustained in a collision. But, I would argue, the tendency to simply attribute a collision to excessive speed has an obvious shortcoming: Physical mechanics are much easier to quantify than human factors. I then ask them, by show of hands, how many of them have been assaulted, had their home broken into, or have been the victim of a violent crime. I ask how many have family members who have had these same experiences. I ask how many have a family member or friend who has died as a victim of violent crime. In each instance, there’s generally a show of hands. These are all emotional experiences. I then ask them in the same manner about collisions: collisions with injuries, and collisions involving death. I usually use the term “accident,” just so I can explain later why they are anything but an accident. It’s somber and personal and uncomfortable, but THAT is my point. We’re all angry and at how uncomfortable and troublesome violent criminals have made us. What about bad drivers? They drive into our homes and businesses. They destroy our roadways and roadway fixtures. They killed our family members to the tune of more than 37,000 people in 2016. This number remains relatively consistent each and every recent year. And this is just the number for the United States. This is basically a medium-sized city of people wiped off of the map each year. This number exceeds the number of deaths in many of our armed conflicts. This is history too, and we should be learning from it. But we aren’t. Bad drivers cost you money as a taxpayer every time they destroy a roadway fixture. You probably can’t even drive a city block without seeing the evidence of their destruction. Bad drivers cost you money every time they clog up the rush-hour grid because their collision is blocking a lane. They cost you money every time they sue your government over a roadway that worked fine for everyone else and then win money in court for their stupidity. Your government (you) has to both give them money and then they also have to make the roadways into the equivalent of a bowling alley with bumpers on the sides. After all, we can’t have people who can’t stay on the roadway getting hurt by things that they shouldn’t be hitting in the first place now can we? Even with all these computer systems to “assist” the modern driver, somehow they still manage to wind up flipped over onto their roof on a dry, straight, flat, level road during daylight hours to the tune of over six million (that’s right, million) crashes a year, every year, since at least 1988. Injuries appear to be going down. This is presumably from occupant protection systems. But even the best (lowest injuries) year on record since 1988 was in 2009, with 1,517,000 injuries. Now that we have covered the “what,” go ahead and ask yourself “why.” It doesn’t make sense, does it? The major causal factors are ignorance, complacency, and a complete lack of due regard for the safety of others. We all like our cars. They make us feel independent. With them we can go places we wouldn’t otherwise be able to. They make us feel secure and often invincible with all that steel around us. A capable driver, in a reliable vehicle, is a force to be reckoned with. The visceral sounds and feelings associated with having, for example, a big truck or a sports car are undeniable. The problem is, those sounds and feelings are all transferred to those around you. Mishandling (yes, mishandling) your vehicle should be akin to mishandling a firearm. Both are tools. Both are deadly when not used properly. Every time a bad driver speeds through a school zone or a neighborhood, they are menacing the people in that area just as surely as if they were waving a loaded gun around. They are a bigger, louder, faster and more dangerous than any land-based major predator on the planet. There’s no minimum safe distance from a bad driver racing through your 25 MPH neighborhood. Road rage is both real and omnipresent. We read stories on the news about drivers battling it out on our roadways. They do it in their vehicles, endangering everyone around them by traveling at reckless speeds. Sometimes they go get guns. How does that make you feel when someone speeds by you or your kids in your neighborhood while you are trying to walk or ride your bicycle? It’s scary—deadly scary. As it should be. The fact of the matter: If you want to kill someone and get away with it with only minor repercussions, the best way to do that is with a vehicle. Ignorance can be cured through education in most instances. But what about banning bad drivers? We might assess, through testing and records, those who aren’t fit to drive—or at least drive under certain circumstances. We can mentor those around us to drive more safely. We must not condone deadly recklessness. As a police officer, taking an active interest in enforcement and actually issuing citations when appropriate is essential. Making sure bad drivers pay the lion’s share of the cost associated with their carnage is yet another tool available. I don’t know why a car needs to go three times the legal speed limit or hit 60 MPH in under 3 seconds. What I do know is the potential carnage of using these powers recklessly. Please take a moment to consider your own driving. Are you safe? Next: Are your citations maximizing safety on our roads? Or are you letting pass those who might be your next carnage report? Sgt. Quaintance has 20 years in public service, currently working for a medium- size agency in Southern Arizona. He has been a peace officer for approximately 11 years, with nearly half of that time on a police motor. Quaintance instruct on the topics of emergency vehicle operation for both vehicles and motorcycles. He has a Master's degree in Business and dual Bachelor's degrees in Psychology and English.